19 notebook computers donated by Intuit, 14 of which are now installed with Ubuntu Linux! Thanks Intuit! 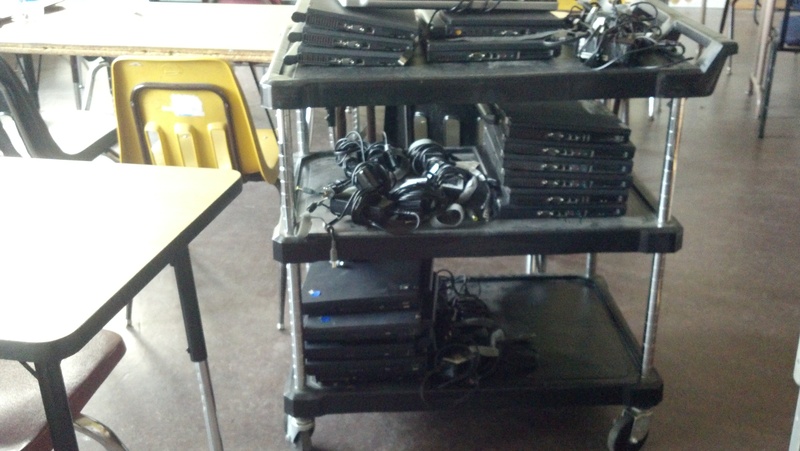 These computers were donated to Partimus by Intuit, so many thanks to Intuit for that! More details about the Intuit donation can be read here and here. This donation is going to make a big difference for Maria Jenerik’s classroom, because there was a fire in one of the buildings housing the Creative Arts Charter School, so space is at a premium at the Creative Arts school. Thanks to Jim Stockford of Systemateka for introducing Partimus Board member Christian Einfeldt to Steve Camuti of Intuit. Steve orchestrated the donation through the halls of Intuit. Today we put in 17 hours of work installing Ubuntu on those 14 computers; and running wire and cable to hook up the three additional machines. Thanks again to James Ouyang and Maestro for your great work! We are particularly grateful to James Ouyang for getting the wifi router running. Maria Jenerik was really thrilled to see that she is now able to get access to the Internet wirelessly in her classroom. Thanks, James! Sometimes such small things make a big difference. Getting the wifi running was the key final bit to making the Intuit notebook computers work well for Maria and her kids. This work today in manually installing the notebook computers was just a temporary bridge step until we are able to mass install a uniform configuration across all of the machines to be administered remotely by our Partimus gurus. It was a really important bridge step, because now Maria Jenerik will be ready to go with her kids on Monday. This was written by Christian Einfeldt. Posted on Sunday, August 19, 2012, at 2:33 am. Filed under News, Uncategorized. Tagged fire, Intuit, James Ouyang, Jim Stockford, Maestro, Maria Jenerik, Steve Camuti, Ubuntu. Bookmark the permalink. Follow comments here with the RSS feed. Post a comment or leave a trackback.